Maj. Gen. Harry H. Critz, commanding general of the U. S. Army Artillery and Missile Center, Ft. Sill, Okla., last week visited 3d Bde. and received extensive briefings on brigade operations. Colonel Scott briefed the general on brigade activities since its arrival in the Republic of Vietnam last December. He also took the Ft. Sill commander on a tour through his "Cacti Blue" battalion area and perimeter. 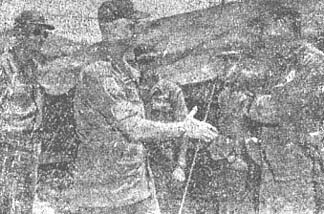 Colonel Jackson and members of his staff briefed General Critz on the "Mighty Ninth" Artillery, including the problems the battalion has encountered because of Vietnam's peculiar "no front" warfare. Among problems discussed were the increased need in certain areas for additional men and equipment; the general use of "6400 mil," or 360 degree firing; the widespread operation areas using separate artillery batteries far removed from battalion control: extensive use of helicopters in artillery operations; and problems involving Vietnam's terrain and climate. The Honorable Cyrus R. Vance, deputy secretary of defense (second from right), and the Honorable Paul R. Ingnatius, assistant secretary of defense (right), visits with Maj. Gen. Fred C. Weyand, CG, 25th Inf. Div. at Cu Chi. Second from left is Maj. Gen. Jonathan O. Seaman, CG, 2nd Field Force, Vietnam. SFC Wallace R. Jacobson, Co. C, 1/27th Inf., became the first man to be awarded the nation's fourth highest award for valor - the Bronze Star - to be awarded by the 25th Inf. Div. in Vietnam. Decorated posthumously, Sergeant Jacobson was on a search-and-clear mission on January 30, when he led his squad to a Viet Cong controlled building in the vicinity of Cu Chi. Operating under heavy sniper fire, Sergeant Jacobson made sure his men were under cover before making a reconnaissance of the house to their front. As he returned to his squad, he was shot from the rear by a hidden sniper. Sergeant Jacobson is survived by his wife, Dorothy Ann, of Pleasant Hills, Calif.
Five "Tropic Lightning" soldiers from 3rd Battalion, 13th Artillery, have been decorated for combat action in Vietnam while serving in the division's now ended shotgun-program. Additionally, two staff officers have received the Army Commendation Medal for meritorious service. Corporal James L. Boehler, Battery C, received the Air Medal, 5th Oak Leaf Cluster, with "V" device, for exceptional valorous actions on Aug. 27, 1965, while serving as a gunner aboard a UH1D helicopter during combat operations near Vi Thanh. 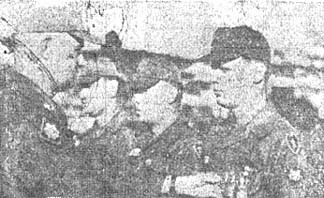 Lauded for meritorious achievement while participating in sustained aerial flight were Private First Class Henry L. Smith, Battery B. who received the 3rd Oak Leaf Cluster to the Air Medal, and Sergeant David A. Craft, Battery C, who was awarded the 1st Oak Leaf Cluster to the Air Medal. Sergeant Ronald G. Barbre, Battery C., was presented with the Air Medal, 4th Oak Leaf Cluster. Specialist Four Patrick B. Shea, Battery B, was awarded the Army Commendation Medal with "V" device for heroism in connection with military operations against the Viet Cong. Shea distinguished himself by exceptionally valorous action last July 1, while serving as a gunner at Soc Trang. Shea was in his quarters when two platoons of Viet Cong launched a surprise mortar attack on the Soc Trang Army Airfield. Upon hearing the first round explode, Shea ran for his aircraft but found he had to cross an area that was under heavy mortar fire. Ignoring the bursting rounds, he made his way across the area under attack and reached his helicopter. He immediately activated his armament system and assisted the crew chief in preparing for immediate takeoff. His quick reaction and bravery were cited as being responsible for the safe evacuation of his aircraft with very little damage done. Lieutenant Colonel William T. Purdy was lauded for the successful planning, organization, execution, and overall supervision of the outloading and movement of 2nd and 3rd Brigades for deployment to Vietnam. He was awarded a 1st Oak Leaf Cluster to the Army Commendation Medal. Major Edward F. McManus, Jr., received the 3rd Oak Leaf Cluster to the Army Commendation Medal for his work in directing the processing of division dependents through the Dependent Processing Center after the division had been alerted for movement to Vietnam. Lt. Col. Aaron E. Walker, commander of 3/13th Arty., presents the Army Commendation Medal with "V" device to Sp4 Patrick B. Shea, of the battalion's 8 Btry., in ceremonies at Schofield Barracks before the unit was deployed to Vietnam. Long sleeve khaki and Army tan shirts are going out of style. But don't junk them yet. They may still be worn if the sleeves are shortened to the same length as regular short sleeve shirts. The alterations must be completed, appropriately enough, in the middle of summer on July 1, 1966. Altered shirts may be worn at any time short sleeve shirts are worn. Mr. Earle Cocke, former national commander of the American Legion and civilian aide to the secretary of the Army for more than eight years, received a first-hand look at 25th Inf. Div. operations at Cu Chi. Maj. Gen. Fred C. Weyand, division CG, met Mr. Cocke at the division helipad and took him directly to the briefing tent where he was filled in on division activities of recent days. Following a briefing by Col. Thomas W. Mellen, division chief of staff, Mr. Cocke toured firing batteries of 1/8th Arty., and living quarters, work areas, bunkers, and mess halls of 1/27th Inf. He was also taken to inspect gun positions of 3/13th Arty. and was briefed on armored operations in the Republic of Vietnam at headquarters, 69th Armor. Rounding out his tour of the base camp, Mr. Cocke inspected the maintenance areas of the 65th Engr. Bn. and the field hospital facilities of the 25th Med. Bn. General William C. Westmoreland, commander, U. S. Military Assistance Command., Vietnam, made his first visit to the division base camp at Cu Chi last week and was met at the division helipad by Maj. Gen. Fred C. Weyand, division CG. The top-ranking American officer in Vietnam arrived at 12:30 p.m. and was taken to the division headquarters area to meet members of General Weyand's staff. From there, they went to the general's mess for lunch. 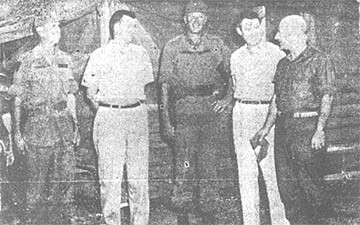 Later, General Westmoreland was given a briefing on Tropic Lightning Division operations. General Weyand also showed him a machine gun captured during the recent operation Kahuku. While in the area, General Westmoreland stopped and talked to Tropic Lightning soldiers about their experiences since arriving in the Republic of Vietnam. General William C. Westmoreland, Commander, U.S. Military Assistance Command, Vietnam, greets Sergeant Richard F. Ritch, Company A, 2nd Battalion, 27th Infantry, during the general's visit to division headquarters at Cu Chi. At left is Major General Fred C. Weyand, Division commanding general. I've always wondered what the term reconnaissance meant. You know when connected with operations of the 3rd Squadron, 4th Cavalry. What I mean to say is that I always have wanted to be a cavalryman and go zooming around the countryside looking for a fight. Ever since Custer met his at the Little Big Horn, there has been an esprit in cavalry units that others try to imitate. Now I know why. The other day 'Charlie' shot down a 'Huey' while elements of the 2nd Brigade, 25th Infantry Division were on operation Kahuku. The job of protecting this fallen bird overnight and the eventual recovery of the damaged craft fell to 'B' Troop, 3rd Squadron, 4th Cavalry. I went with them to bring back the pieces. Those guys really start the day early. It was out of the sack at 0430, chow at 0500, pack up and move out at 0530. It was dark, dusty and dirty as the tanks and armored personnel carriers (APC) of Bravo Troop moved out of their motor pool. The feeling I got was that of riding a roller coaster through a sand storm, with a full moon above staring down wondering why we weren't still in bed. In the APC, manning a 50 cal. machine gun and running the operation was Troop Commander Captain Carl R. Quickmire, of Van Etten, New York. His fighting uniform consists of pulling off his fatigue shirt and pulling on a 'flak jacket,' tossing his fatigue cap on a box of grenades and donning a helmet wired so that he can talk on at least three channels just by flipping a switch. After he went through his initial switch - flipping and rattling off call signs that were evidently intended to confuse the enemy, we were on our way. "Circle Saber 40095 this is Circle Saber 30048." Then with a quick switch - "Sugar Sawtooth 36 this is Sugar Sawtooth 5, hold your unit at their present position." Another switch and he used a third set of confusion that made me believe it was going to be a long day just listening to the transmissions. Fifteen minutes had gone by and I was already tired. "Hey, you." It was Staff Sergeant Deneel Smith, of Evanston, Indiana, talking and he was looking at me. "Yeah, sergeant, what do you need," I answered. He knew I was from the information office and he had to leave someone behind to give me room to ride. "How about manning this machinegun for us?" Well, I had thought it was going to be a sort of a joy ride for me but there I was riding shotgun on an M60. It had been a while since I had familiarized with the brute, but a short course by the sergeant and I felt like John Wayne. Up and down, with a resounding thump on the down, the APCs crawled across the dikes of the rice paddies and into the area of the crashed helicopter. A quick call for "smoke" to give us a final direction into the secure zone and we broke into a clearing, that was the emergency landing spot the day before. With the efficiency characteristic of a well trained team, the 1st Platoon, commanded by Lieutenant Daniel Speilman of Beckley, W.Va.. policed up the burned and beat pieces of the once-proud gunship, loaded them on the backs of the APCs and off they trooped. This was B Troop's mission for the day and it had been accomplished in record time. The troop was ready to move back to base camp. Such was not the fate of a unit that does things fast and well. The Viet Cong had just ambushed a popular force trying to clear the roadblocks on Highway One leading to Tay Ninh. Bravo's new mission: proceed to the area of the ambush and report your observations - and, as always kill any VC still in the area. Highway One is a dream to ride on after the tooth-cracking jaunt across the paddies, and in record time we were approaching the ambush area. Suddenly the M60 became more precious to me and I checked around inside the APC to once again spot those other cans of ammo, Just in case. "Charlie" had done his job. A 1/4 ton was stopped on the side of the road, riddled with bullets and grenade fragments. Houses on both sides of the town were on fire. The streets were all but deserted. The attackers had hit quick and hard, killing the jeep's occupants, stripping them of their equipment and then disappeared into the surrounding woods. Bravo Troop hit the area in combat formation, peeling off and surrounding the village as if they had practiced it. The search of the town was unfruitful and the troop was ordered to return to the base camp and submit its report. When the APC stopped at the motor pool, I jumped out with a thank you and sauntered off down the road. Looking over my shoulder, I realized that the troop wasn't nearly through working as the men were starting to clean and check weapons, secure ammunition and clean out the fighting compartments of their vehicles. As with every military unit, the day is over only when all the necessary maintenance is done. The attitude of the troops, morale they call it, is tops in Bravo Troop. As he was checking over his radio equipment one trooper managed to say, "Well, that was a pretty good day. I wonder what's in store tomorrow?" Eddie Fisher, who will appear at the new 2d Bde. Theater at Cu Chi on April 21, shown as he performed for members of the 1st Bde., 101st Abn. Div. All Army personnel on active duty may now be paid cash awards of up to $25,000 from appropriated funds for suggestions, inventions and scientific achievements. The new armed forces-wide policy, based on legislation long supported by the Army, puts civilian employees and military personnel - enlisted and commissioned - on equal footing as participants in the Army Incentive Awards Program. The new Incentive Awards Program comes under the 25th Infantry Division Suggestion Program, as spelled out in Division Regulation 672-4. The regulation provides for two incentive awards activity committees - one for reviewing troop operations suggestions and one for reviewing technical assistance. Participants in the program should submit suggestions to their supervisors or commanders; for assistance in sending them through the proper channels as outlined in the above regulation. The G-1 is in charge of administering the division suggestion program. The new policy is retroactive to Sept. 22, 1965," the date on which the President signed the enabling legislation. This means that suggestions, inventions, and achievements by military personnel approved or adopted on or after that date may receive the cash awards. Another effect of the new policy is to authorize cash awards to groups of military and civilian personnel. As in the past, a group receives a single cash award (up to the maximum of $25,000), which is divided among its members. Despite all the security around the division's base camp at Cu Chi and 3rd Brigade's Pleiku home, the invasion of disease-carrying mosquitoes cannot be stopped. The number of these infiltrators cannot be accurately estimated, but medical officials do know how much harm they can cause and what can be done to reduce their effectiveness in producing disease. Malaria-producing mosquitoes affect 300 million people today. During World War II alone, more than half a million troops were taken from the battlefields and admitted to hospitals with malaria. During the same war, the Tropic Lightning Division reduced the incidence of malaria fifty-fold by recognizing the need to protect the troops and by practicing protective measures against the disease. It is significant that, according to medical officials, the majority of malaria cases occur in the Pacific Theater. In Vietnam, the division is once again faced with the presence of malaria-producing mosquitoes, and the upcoming rainy season will provide excellent breeding grounds for these mosquitoes. 1. Take anti-malaria pills every Monday. 2. Keep your skin protected from dusk till dawn. 3. Apply mosquito skin repellent diligently. 4. Use mosquito bed nets and head nets, tucking in the edges carefully. Keep the nets in good repair. 5. Use aerosol bombs in tents and billets. 6. Spray the insides of bed nets before going to sleep. There are many enemies to Vietnam; prepare yourself to fight them all. Troops from 1st Battalion, 14th Infantry, sweep the smoldering ruins of Ban Dung following pitched battle with Viet Cong troops, who leveled the village. Displaced villagers from Ban Dung carry their few salvaged possessions from their smoking village to Buon Brieng, three miles away. Lt. Al Morrow, civil affairs officer for 2nd Battalion, 9th Artillery, discusses the distribution of a truckload of supplies for displaced villagers of Ban Dung in Darlac Province. THE INNOCENT SUFFER . . .
"We fight to great disadvantage when we fight those who have nothing to lose." The wan, empty faces of the homeless, and hungry are the mask that has become war. The blank stares of innocent villagers in Vietnam differ only because they are victims of a brutality often inflicted by their Viet Cong neighbors. On operation Garfield, 3rd Brigade's recent action conducted in northern Darlac Province, an entire Montagnard village became involved in the war. The involvement was hardly pleasant, nor was it invited. It occurred on two horror-filled days when a brigade civic action team entered the village of Ban Dung to talk to the people to learn of any Viet Cong activity in the area and to establish medical visits. As the team left the village the trouble began when small arms fire ripped out from a nearby stand of woods. The shots were just the opening round of a stiff firefight between the Viet Cong and the outnumbered "Broncos." A call for help quickly brought reinforcements pouring into the area on the heels of artillery barrages dumped on enemy positions. As the fighting continued, Captain John F. Fielding, 1st Battalion, 35th Infantry intelligence officer, noticed a number of guerrillas running through the village setting fire to the tinder dry houses. The next several days turned Ban Dung into a virtual inferno. As most of the villagers fled to the mountains, the VC continued to occupy positions around the village. Losing interest in the burned out ruins of the village, the enemy abandoned their positions within two days, leaving behind them 350 homeless Montagnard villagers. Realizing it would be impossible to rebuild his village before the approaching rainy season, Ban Dung's chief went to Buon Brieng, three miles to the east, and requested permission of the village chief there to move the 27 stranded villagers into Buon Brieng. Permission quickly granted, the sun hadn't yet dropped behind the highland hills before the first of the refugees were moving into their new homes. Captain Thomas Lyerly, brigade civil affairs officer, enlisted the help of Darlac Province headquarters in Ban Me Thuot in getting the refugees relocated. 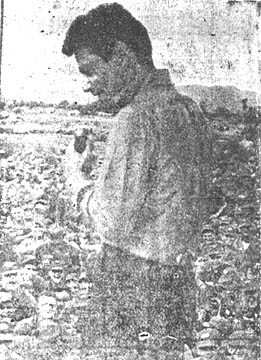 The province chief directed the district chief to provide a team of civil servants to aid in registering the people, advising them on planting new crops, and providing them with replacements for the food and livestock which were destroyed by the Viet Cong. For the next three days, long linesof refugees streamed into Buon Brieng, carrying on their backs all their belongings - all they could salvage from their burned and blasted homes. Buon Brieng villagers had vacated several of the long thatched-roofed houses. As the refugees entered the village, they were taken directly to their new homes, raised houses which can accommodate as many as 30 people in their 800 square feet of floor space. As settlement of the refugees continued, Air Force and Army planes landed at the crude dirt runway near the village. They came from the province headquarters carrying food and materials to aid in relocation of the refugees. A brigade team took two truckloads of materials to Buon Brieng for the new residents, including 1,000 sheets of aluminum roofing, 3,500 pounds of wheat, 100 blankets, 50 two-gallon tins of cooking oil, boxes of soap and assorted items of clothing. Medical teams, headed by Brigade Surgeon Captain William R. Gardiner, began making daily visits to the village to treat the many refugees who had been wounded in the fierce fighting at Ban Dung. The more seriously wounded were evacuated to the Army Special Forces hospital at Pleiku 50 miles to the north. Days later, flying over the village, one could see several shiny-roofed, new structures and several more in various stages of completion. But these villagers were luckier than many. Frequently, the Viet Cong put in an appearance, do their dirty work and disappear. And there are no Americans nearby to pick up the pieces, the pieces of innocent lives shattered by war. MSgt Levi Haina Jr., of 3923-A Montague Street, Schofield Barracks, Hawaii, became the first man in the 25th MP Co. to reenlist while serving in the Republic of Vietnam. A native of Hilo, Hawaii, Sergeant Haina was sworn in on April 7 at MP headquarters at Cu Chi by Lt. Col. George Black, 25th Inf. Div. provost marshal. This was his sixth reenlistment during his 20 years of military service. Haina, who is operations NCO for 25th MP Company, is a veteran of World War II, Korea and now Vietnam. Elements of the 1st Battalion (Mechanized), 5th Infantry, conducted an early-morning patrol in Binh Duong Province Sunday, engaging 30 Viet Cong guerrillas. The action was described by one officer as "cutting wheat with a scythe." An armored personnel carrier of 1/5th was hit by an anti-tank weapon, believed to be a 57mm recoilless rifle, but sustained only minor damage. A 57mm round and four expended shells were captured later. Also confiscated near Cu Chi were two Browning automatic rifles, two 7.62mm Russian carbines, a submachinegun, a Chinese Communist assault rifle, and a wheeled mount for a Chinese Communist 7.9mm anti-aircraft gun. During the action a forward observer for 1st Battalion, 8th Artillery, sighted 35 VC moving in an open field and called for immediate howitzer fire. Meanwhile, in Hau Nghia Province, men of the 1st Battalion, 27th Infantry, killed two VC with mortar rounds while receiving heavy enemy fire. A security force also apprehended 11 Viet Cong suspects, who were evacuated to a prisoner-of-war compound, and later released to the National Police. After almost seven continuous, dusty weeks of combat operations, the 3d Bde., "Broncos" have returned to their Pleiku base camp. Following a massive airlift of most of the brigade south to Ban Me Thuot on February 25, the men of the brigade fought to the north and west on operation Garfield. When Garfield ended on March 24, the brigade's base was located at Buon Brieng, a small Montagnard outpost 60 miles north of Ban Me Thuot. Without a break, the brigade joined 1st Cav. Div. for operation Lincoln on March 25 and the "Tropic Lightning" soldiers continued to strike at the Viet Cong and North Vietnamese. 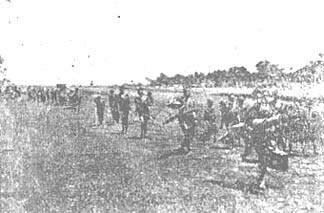 On March 31, the brigade again shifted its base north. The new base of operations was a Special Forces camp, 100 road miles northwest of Buon Brieng at Duc Co, five miles from the Cambodian border. The moves from Ban Me Thuot to Buon Brieng to Duc Co were made by road, marking the first time highway 14, the north-south route through central Vietnam, had been opened by U.S. forces. During the two consecutive operations, the Broncos repeatedly struck the communists, leaving behind 103 North Vietnamese and eight Viet Cong dead in Garfield. Air and artillery strikes in support of brigade operations accounted for another 20 North Vietnamese killed. Twelve Viet Cong were captured and 78 suspects were detained by the brigade during Garfield. The brigade also posted one of the highest captured weapons to body-count ratios to date in the war. A total of 65 weapons were taken, including 47 small arms; 16 automatic weapons; one American M-79 grenade launcher; and one 75mm recoilless rifle. Large quantities of ammunition were captured during Garfield. This included 102 hand grenades, 38 B-40 rockets, 1,200 12.7mm rounds, 27,000 small arms rounds, and three Claymore mines. A complete field hospital was also captured, resulting in over 100 pounds of drugs and a large assortment of surgical instruments being captured. A total of 400 uniforms, 234 rucksacks, 11 telephones, a switchboard and 150 pounds of documents and photographs were also seized. 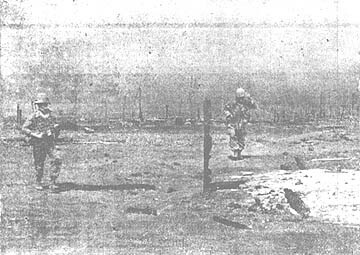 Three hundred enemy structures were destroyed during the operation. After "Lincoln," Colonel Everette A. Stoutner, 3d Bde. CO said, "I think the greatest benefit to us on this operation was the fine experience we gained working with the battle-tested 1st Cav. Div. Civic action projects were conducted by all brigade elements during both operations. Notable among these were several bridges constructed to different villages, donations of food, clothing and other items. Regular sick calls were held for local residents in the brigade's areas of operation. VC Dodge Flying, Green "Angel"
Flying artillery observance in a virtually defenseless OH23G helicopter is hardly the easiest job in the world. Unlike the heavily armed UH1B ("Huey") choppers the bubble-headed observation helicopters are relatively helpless. Nevertheless, they bravely fly solo deep into enemy territory, report hostile positions and call in artillery to destroy them. I went up recently with Captain John W. Kearns, of Salem, W. Va., the pilot of Angel, an observation helicopter that has seen more than 250 hours of flight time and 400 combat sorties in little more than two months in support of 1st Battalion, 8th Artillery. Leaving 8th Arty, and the dust of Cu Chi, the helicopter headed worth toward Ho Bo Woods, an area controlled by the V iet Cong for more than 15 years. We skimmed over shining, green, rubber plantations, patches of rice paddies and farm land. The earth below was beautiful except for craters, the end result of American firepower. "We have heavy machinegun fire at coordinates 645, 242." the radio voice from fire direction center said. And that's where we were heading. "He just notified me to see if we can spot the machineguns, the captain said. The bad part about today is that the ceiling is so low. If you can't get above 1,500 feet, the small arm's fire may get you." Capt. Kearns pointed out a spot near a rubber plantation where he had evacuated casualties when 1st Battalion, 27th Infantry, ran into trouble. Below we saw what appeared to be a burning tree in the middle of a field, but we moved on. We could see two Hueys in the distance. "There's two or three V.C. down there now," Capt. Kearns said suddenly. "They're probably messengers. See, they jumped into that group of trees." Capt, Kearns radioed the coordinates of the location to the fire direction center. The white phosphorous marked the explosion of the first 105mm shell, and the captain was correct. He called back, "Left 150, drop 200." "Those people haven't moved yet," he stated. "There's no trenches. They can't get out." After two adjustments, a volley of six 105mm shells thundered on target. "If there was anybody in there," Capt. Kearns said, "they're gone. Now we'll try to take a look at the machinegun emplacement and see if anyone's there." We would not go down to the road for a body count. It would be too dangerous. "You can see the trench down there," he said a few minutes later. I looked down but could see nothing. He was expecting me to see positions he had trained years to recognize. "If you see a flash, let me know," he said, as he swung the helicopter in an arc, staying a safe distance from the suspected emplacement. "I don't see any movement," he said, "but I'm going to fire at it just in case." "We're receiving small arms fire," Capt. Kearns announced, more to the fire direction center than to me. Why couldn't they hit us? We seemed to offer a big, slow target, yet at 1,500 to 2,000 feet we were a minimum of 800 meters laterally from the emplacements, and it would take an expert to score. The white phosphorous shell hit. The captain made one correction and sent two volleys in. Twelve shells exploded. They looked like they hit on target. Capt. Kearns moved closer and dropped the helicopter a few hundred feet. "I'm just waiting for more fire," he said, matter of factly. "You're just like a guinea pig out here, but that's the only way to find out if they're still there." We moved even closer, but no life stirred from the machine gun emplacement. The area around it was now scarred with craters. "If they don't shoot at us now," Capt Kearns said, "I don't know what they're waiting on." They didn't shoot; maybe they were dead or maybe they were waiting for tomorrow. Charlie didn't get his mail one night last week. 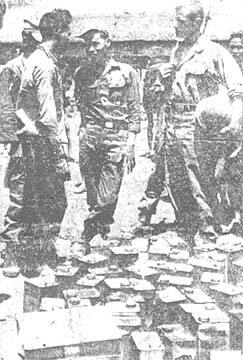 Three Viet Cong postmen, armed with grenades and toting mail sacks on bicycles, were ambushed outside Cu Chi Saturday by a reconnaissance platoon from Company B, 1st Battalion (Mechanized), 5th Infantry. Assigned the mission of patrolling an area to see if the Viet Cong had re-entered to dig up arms caches and rebuild trenches and tunnels after operation Circle Pines, the recon platoon found fresh bicycle tracks and placed an ambush at a crossroads. The first two Viet Cong approached the intersection on bicycles but fled when the two squads opened fire. Ten minutes later, the mailmen arrived but were not so lucky. All three were cut down by small arms fire, and their mail was captured. The trap was reset by the Mech troopers and a lone VC mounted on his bicycle fell into the snare, followed by three more several minutes later. In all, seven VC, nine bicycles and three weapons fell prey to the 1/5th trap. Viet Cong guerrillas are getting no dessert at Cu Chi. During the recent operation Circle Pines, Company C, 1st Battalion (Mechanized), 5th Infantry, captured two caches containing five tons of rice and five metal tins of brown sugar. The brown sugar is eaten by guerrillas for quick energy before battle. It also makes a tasty dessert in contrast to the bland daily diet of rice. Captain James C. Andress, company commander, said the sugar was found in an underground Viet Cong hiding place. One booby-trapped rice cache was destroyed. The other cache of rice was given to friendly villagers. In addition to the rice and brown sugar, the 1/5th unit captured some equipment, including three boxes containing about 90 flashlights. 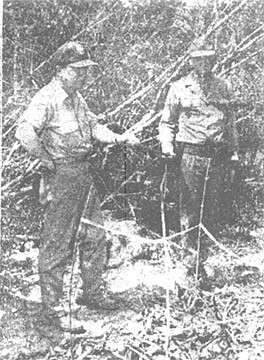 Senator John C. Tower (R-Texas) tests the sharpness of a punji stake while being shown some of the Viet Cong traps laid for members of the 2d Bde. The senator was shown around by the Wolfhounds.